Today I almost cried as I saw my wine filling the bottles on the line. Notes about my house: There's a frog who has been serenading me each night from under my window. The big hawks stole the 4 koi fish from the front yard pond. When the quail take off they sound like little helecopters. Wanna update the blog site and post more, tried a new photo thing with Flicker and a flash thingy so the pics are in a cool mosaic. Can you see it? Maybe I need to move back to NY so I'm really a wino in nyc. It's Neil's bday too. I was told that some researcher on Good Morning America said that today was supposed to be the most depressing day of the year. It was also said that he should meet me. 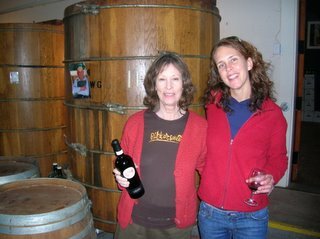 This is Susan Preston of Preston Vineyards (along with my bud Caitlyn who works in organic produce) in the Dry Creek Valley of Sonoma, just outside of Healdsburg. They are organic farmers and make bread and olive oil too. I tasted their Syrah, Barbera and a Rhone-style blend, and a cool thing they have available on Sundays is a jug wine. “Guadagni Red” comes in a 3-liter jug, it's a blend mostly of Zinfandel, Cinsault and Carignane. I tasted another Zin "field blend" from Acorn winery, Russian River Valley. It was rich and intense. Field blend is a traditional practice when different varieties of grapes are planted side-by-side, then harvested and fermented together. My old life would have taken me to MacWorld in SF this month, but my new life has me going to the Unified Wine & Grape Symposium in Sacramento next week. Just think of it, an entire convention center filled with wine-relating everything. I hope it's as good as a whole room filled with mac geeks and a glimps of Steve Jobs... A barrel vendor gave me a t-shirt today with this printed on the back: "Getting toasted to ensure deep penetration." Slow toasting on the inside of the barrel means that the extractable substances in the wood are caramelized to a good depth. Wine, as it ages in barrel, will soak up the good stuff. At the winery this week we finished blending the second half (almost 50,000 gallons) of the Sauv Blanc. We set up this cool filter that looks like the mix of a rocket and coffee maker for the 1st S.B. blend. After it goes through the rocket, then it'll go into the bottle! 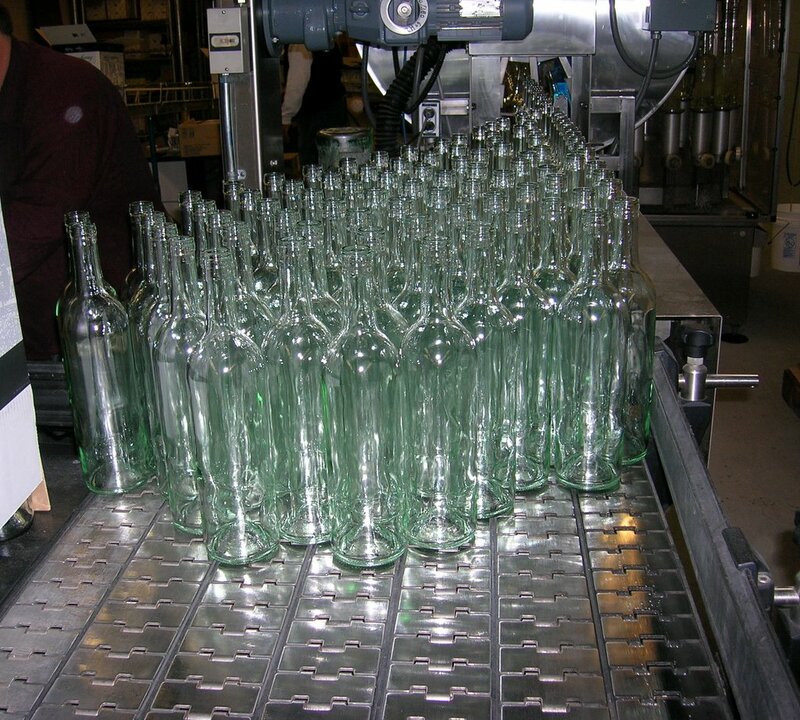 We'll start bottling after the wine symposium. I'm off to So. Cal for the weekend! 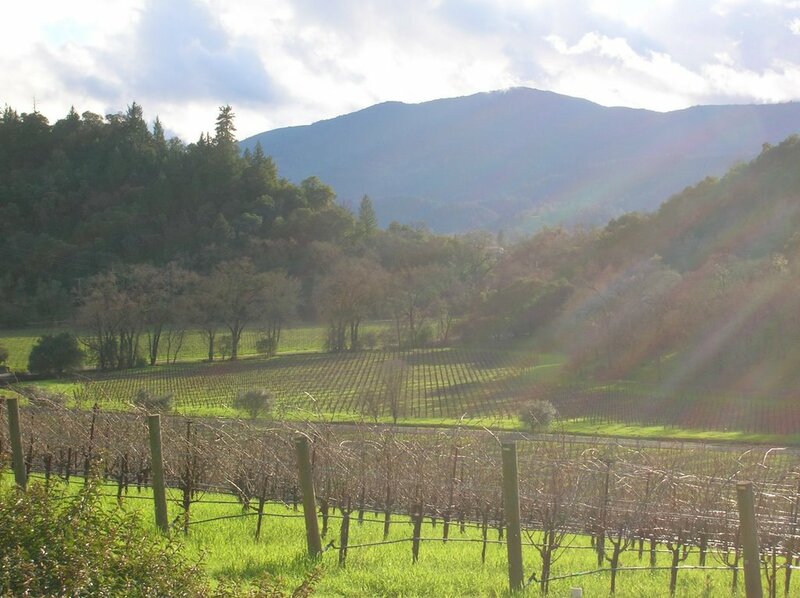 This is the view from the winery at Joseph Phelps in Spring Valley near St. Helena. I had friends in for the weekend from NYC, SF and LA. ZuZu for tapas in downtown Napa is highly recommended. The food at the Martini House in St. Helena was perfect, the dining room is brilliant and the bar downstairs is beautiful. The service needs a little polish, but it felt so good to be there it really didn't matter. If you love mushrooms this is the place for you because chef Todd Humphries offers a mushroom tasting menu, along with wine pairings if you desire. The preparations and presentations were wonderful and far from boring. That night, for me, Gewurztraminer was going with everything. Picnic and winery visit to the Dry Creek area of Sonoma was fun, but the poolside sing along of 'Total Eclipse of the Heart' was the weekend's highlight and brought it all home. I'm running out of time, well actually I mean I'm running out of money. I'll have to get a 'real' job soon. My winery gig ends in about 7 weeks, then I'm off for some wine touring in France and Italy. Sort of a b-day gift to me, but it's a trip I need to make (mainly because I can) so I can study wine. Please wish me a happy birthday on the 24th and as a present buy yourself a bottle of wine, drink it, enjoy it and write to me about it. If you have any advice on travel to Burgundy and Piedmont, share that with me too. "... sake has 1/3 the acidity of wine... it has far lower histamine levels... and of course how it is pasteurized and as such has no sulfites." 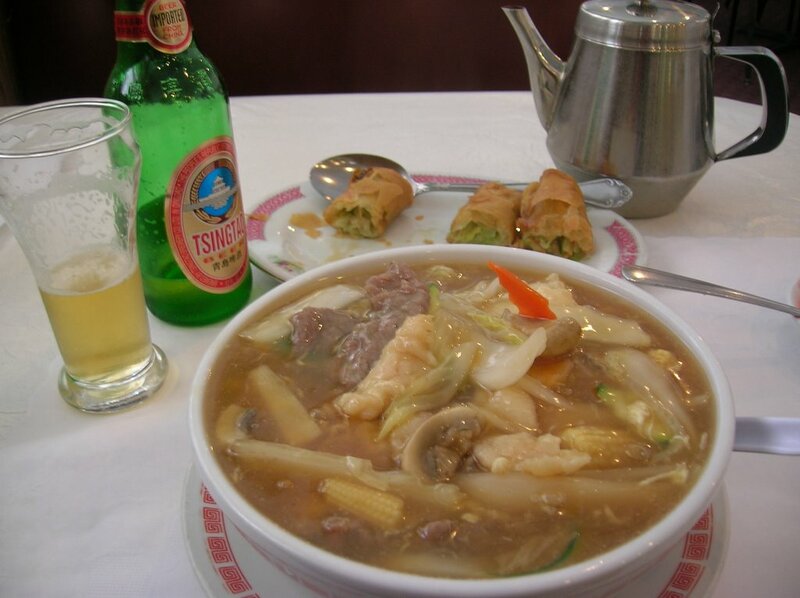 The hot stuff I usually drink is not the best as far as quality goes, but I always have such a good time drinking it. More research needed here. Jon Inazaki turned me onto this place and I've yet to go, but next time I'm there (to see Willie Nelson at the Filmore) I'm going. p.s. I learned, back in New York, that mold is actually one of the ingredients needed to make sake. It's Friday and the day started off great as I was asked to rinse off a crate full of bungs, then later I had to smell a bunch of bung holes... to make sure the barrels were ok. Get your mind out of the gutter. We placed 3 tanks of 2005 Cabernet into oak barrels today. The flood here wasn't that bad for me, but it was for others. A bunch of places had to close down and people missed out on making money. I retuned to the winery after a great holiday break and all was fine there, but we found a fish washed up near our presses. We just completed blending more than 49,000 gal. of Sauv Blanc, and our fist bottling will be 20,000 cases in a few weeks (20,000 more in Feb./March). After the different tanks/lots were blended, we worked on clarification and stabilization. Check out the pics. Bentonite is used for fining (claifying) the wine, as well as heat stabilizing so it will never get hazy if it warms up. To cold stabilize, the tanks are chilled for a few weeks with some cream of tartar added so tartaric crystals will form in the tank instead of the bottle.